Andy Zhang is among Australia’s most high-profile collectors — and highly active on social media. His pieces tend to inhabit the top end of town, and statements such as “I thought I’d wear Richard Mille for life” should not surprise. There are some horological heavyweights appearing on his Instagram account, daily. Which was where we noticed the 2017 Rolex Sea-Dweller. Andy explains how and why he’s fallen under the spell of a watch he initially thought was “average”. When did you first see the 2017 Sea-Dweller in the metal? I first saw it in Sydney on the wrist of a friend. It looked average. I though it was just a bigger Submariner. But when we went out of the restaurant and the sun hit it, I noticed the dial. What about the dial surprised you? Not just the red line of text, which is most obvious, but it was the matt, almost tropical dial. It’s apparently technically a gloss dial, but if you look at it in contrast to my Patek Pilot’s dial, it’s the same finish. It’s not glossy at all. When the sun hits it, it looks grey, not 100% black. Eventually it will look tropical, it’s amazing. 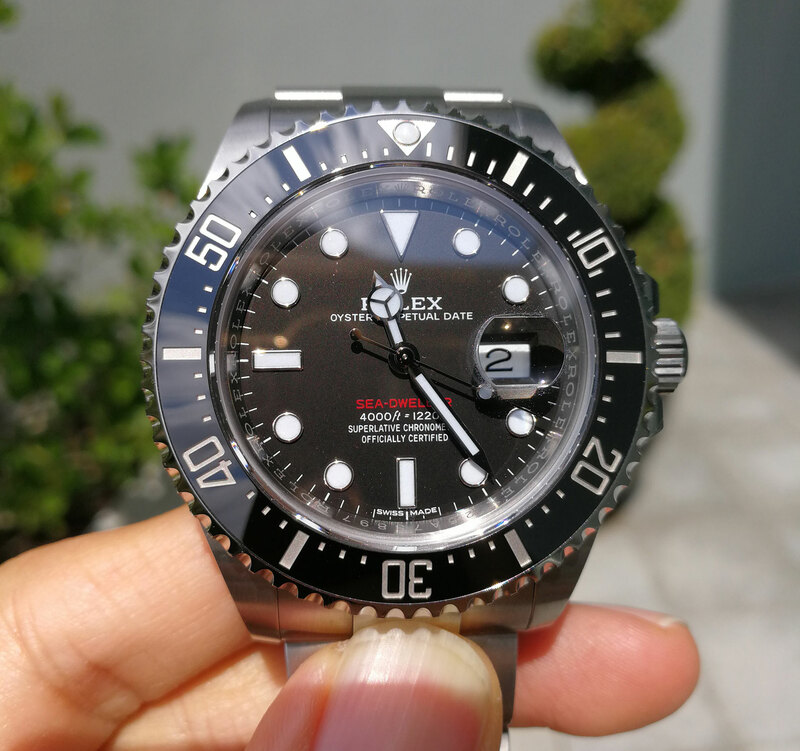 The ceramic bezel, it is what it is, it doesn’t change too much, but this dial is one of the best dials on a modern Rolex in a very long time. In the summer in Sydney, when I walk on the street and check the dial in the sunshine, it makes my day. In my opinion, the best possible Rolex is a modern watch with a bit of a vintage dial. If you check it indoors it looks glossy, but it’s not, that’s just the sapphire glass. How did you rate the feeling on the wrist? They really nailed the job there. It sits pretty well on the wrist … actually it’s perfect. I wear it every day. 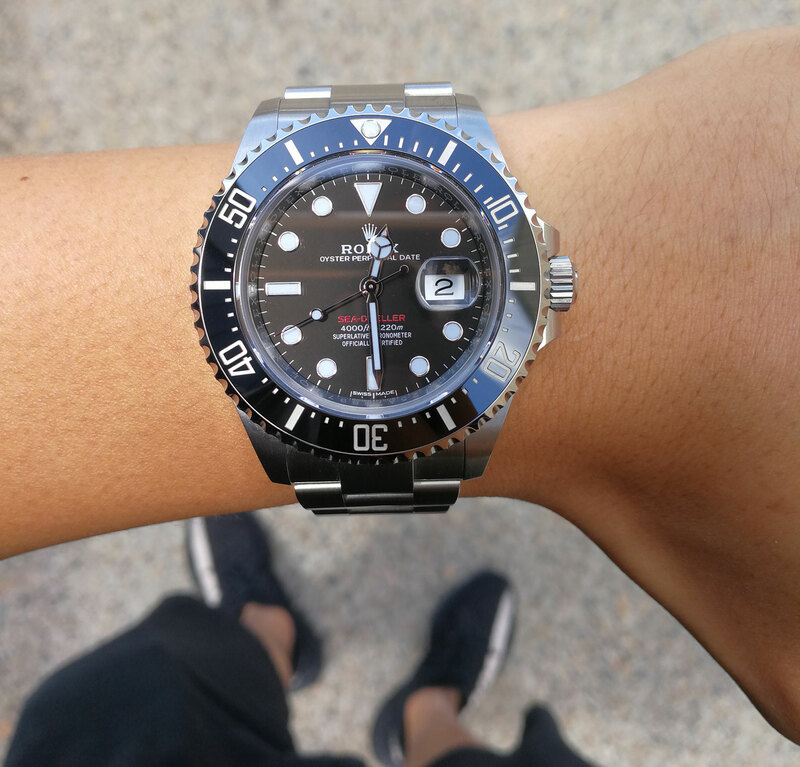 The DSSD is always tipping off your wrist because it’s 44mm and quite high. This slightly smaller size makes it sit perfectly. But it actually wears smaller than 43mm. The whole watch looks like 42mm because of the ceramic bezel. The ceramic bezel is shiny and the dial is matt, so when you look at the watch it looks smaller. If everything is shiny, it looks larger, like on the Batman. In the summer in Sydney, when I walk on the street and check the dial in the sunshine, it makes my day. I’ve been wearing it every day, rotating with the Patek. It takes more wrist time off my Richard Mille than I ever would have imagined. I even wear it in the shower and the blue chromalight is amazing in the night. I thought I was going to wear a RM for the rest of my life, but when you put on the SD it handles whatever you’re wearing, shorts or suit. 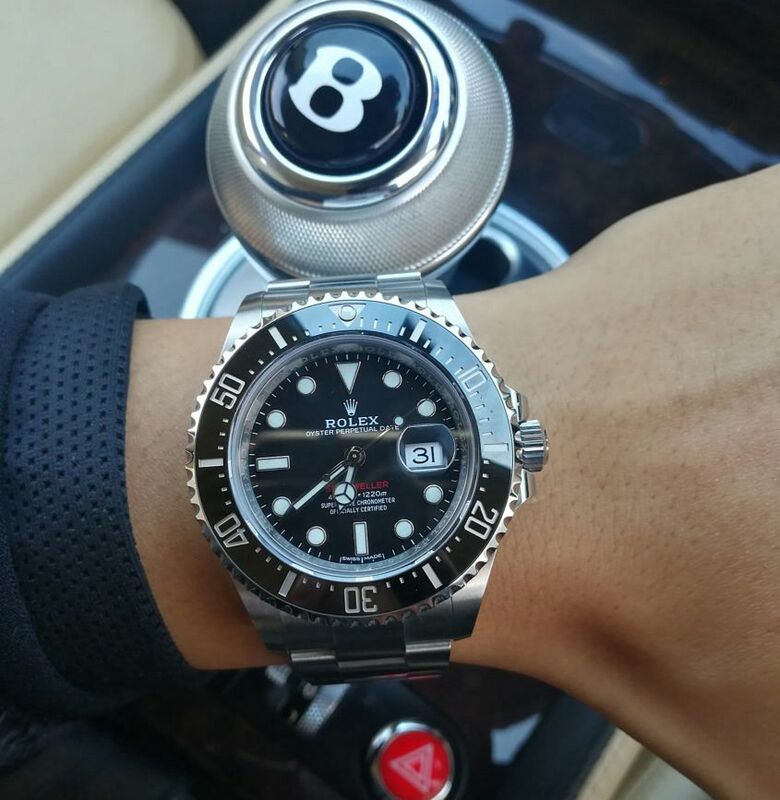 Have you owned a Rolex before the Sea-Dweller? I had a Hulk, but I gave it to my wife. 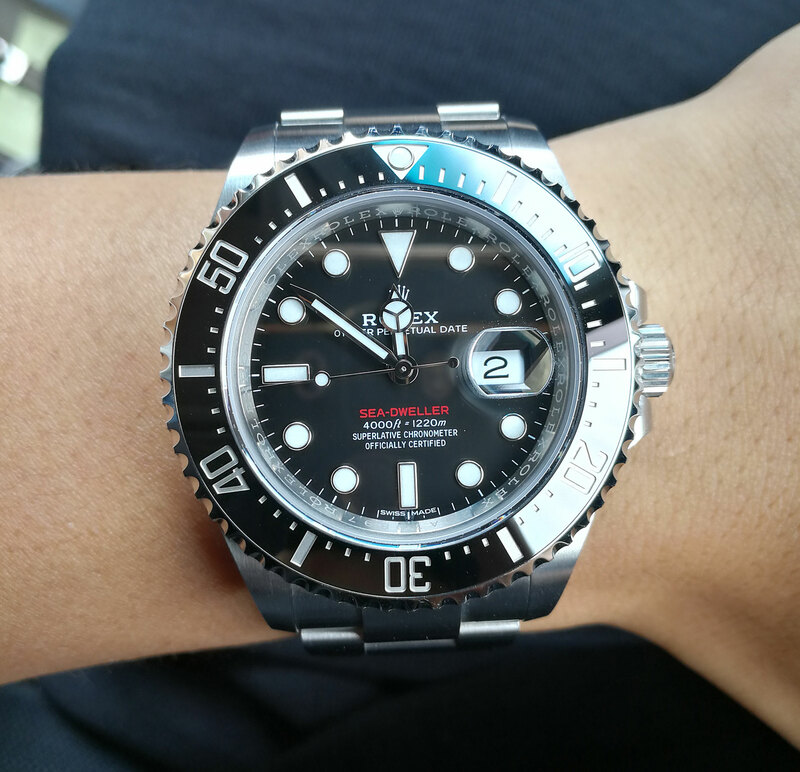 This is now my only Rolex. The thing I find about this brand is that when I have one, I want to wear it, it doesn’t go in the watch box – you’ve got to wear it. One of the drawbacks with this watch is that I went to Hermès and tried to get a strap, but because of the weight of the case it doesn’t really fit. I’m still going to keep looking though. A leather NATO could be a good option. But for now, it’s very happy on its bracelet. It’s so comfortable. How were expectations versus reality for this model? The watch actually is better than I expected. 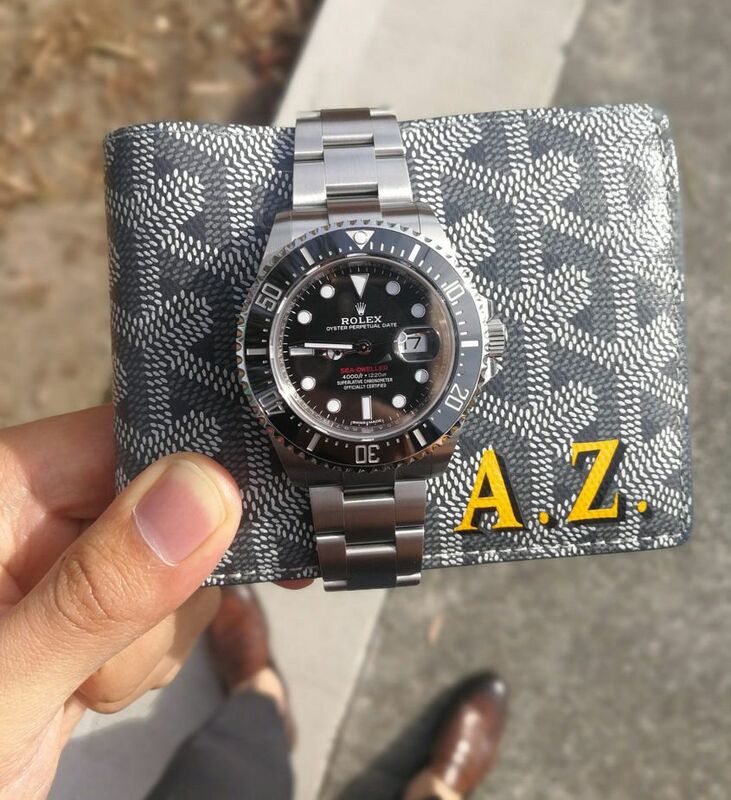 A word of advice: the Rolex official pictures don’t look appealing, you really need to try the real one – that’s what turned me around. Hopefully they can make the anniversary Submariner with the same dial. In the long term, I also expect this anniversary model to hold its value too. What sort of lifestyle does this watch suit? I recommend the Sea-Dweller for those who are energetic and passionate. I’m a gym guy, and when you get a bit of muscle you definitely want to wear this watch. It has a presence to it, without overpowering your arm – the red line brings out the dial, it’s bold.